Our Chengdu project, "Li Shui Jin Du", is located in Xindu, a suburban town approximately 30 kilometers from the north of Chengdu city, Sichuan province. The Shulong Expressway, completed in April 2005, connects Xindu to Chengdu. Average commuting time from Xindu to Chengdu, vice versa, is approximately between 20 to 30 minutes. 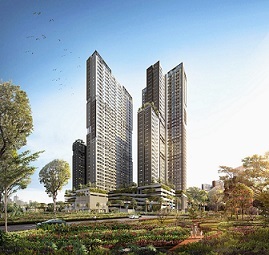 With a site area of approximately 4.8 hectares, this high-rise condominium project consists of nine blocks of 1,205 residential apartments with total area of 138,278 square metres, one block of retail space with total area of 3,301 square metres; and 499 car park lots. It aims to convey a tranquil concept of a relaxed lifestyle. As such, its landscaping works include sculptures, pools and gardens planned in accordance with good feng shui. The construction of this project was completed in March 2009 and as of 31 December 2011, about 99% of the total units of residential apartments were sold and 100% of the total retail space units were sold respectively.